Home / Guilty Pleasures / Where Have All The Tim Tams Gone? My recent visit to Target also brought about an unexpected and not so happy sight to be seen. 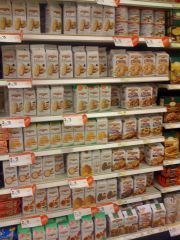 The Pepperidge Farm Cookie section in Target not only had no Tim Tams left, there wasn’t even a spot on the shelf for them any more! This criminal injustice left me a bit angered at Target because in the heat of the moment, they were the easiest uhm… target… to be upset with. If you’re not familiar with Tim Tams, they are just the most amazing cookies from Australia (although Aussie’s will correct you and state they are “biscuits” not “cookies”). In early 2009, Pepperidge Farms cookies brought them in to be sold at Target exclusively for a limited period of time to test them out to see if they’d take off in popularity here in North America. The Tim Tams are not actually made by Pepperidge Farms, but by Arnott’s of Australia, who in turn just wrap the cookies in Pepperidge Farms logo packaging and ship them off to America. So to those who think the Pepperidge Farms packaged Tim Tams are inferior to Australia’s Arnott’s labeled Tim Tams, they’re exactly the same and made by the same machines. Of course, this original test marketing was right around the time I was starting the Belly Fat Cure so cookies were not part of that plan due to the high sugar content. I didn’t buy any of them during Target’s originally carrying the product but I certainly made sure to tell people about them because I really wanted to see them become a permanent product on store shelves here in America. I knew when the test was done they’d be gone, but I was hopeful they’d be back some day. In the fall, Pepperidge Farms brought them back to Target, and Target was making a big deal out of being the exclusive retailer that would have the Dark Chocolate covered Tim Tams. This announcement made it seem like Tim Tams would be more widely available at least for the original Chocolate Creme and Caramel flavors. Despite this supposed availability elsewhere, I never saw them anywhere outside of Target stores. When I mentioned it to some local friends, they told me some of the other stores they saw Tim Tams in, but in North County of San Diego, only the Target stores had them. Since I’d dropped a lot of weight with the Belly Fat Cure, and I no longer felt I needed to as intently follow the program, I felt I could take advantage of an occasional treat of a Tim Tam as a periodic indulgence. So maybe once every other month I purchased a package. That is until I went into Target and found the Tim Tams gone! I was outraged because I’d been looking forward to this treat. And they were completely gone from Target’s shelves. I looked up information on the Internet and comes to find out that Pepperidge Farms was only intending to make Tim Tams a seasonal product, granted a very long season, for about six months out of the year. So instead of carrying them year round (as I had thought they were going to be) they’re being temporarily discontinued until the fall. I was really angry about this because I never got the chance to stock up on the Tim Tams before they disappeared. How rude of them! Personally I think Pepperidge Farms are complete morons for not carrying Tim Tams year round, as they’re amazing products and a great reminder to me of the fun I had in Australia the couple of times I’ve been there. Maybe they’re trying to follow the Disney approach where instead of constant availability they pull them off the market for a while so they can justify keeping them a premium product (although that approach hasn’t hindered the year round availability nor price of their other “premium” cookies that they themselves actually make.) In any case, I’m not happy with Pepperidge Farms as a result of no warning they were pulling the Tim Tams out availability until October and no chance to stock up.